Spread the poblano, garlic, serrano, tomatillos and onion on a rimmed baking sheet and slide it under a preheated broiler as close to the broiler as possible to roast the vegetables. After 4 or 5 minutes, when the vegetables are blotchy-black and softening, turn them and roast the other side. Remove the poblano to a bowl and cover with a kitchen towel. When it has cooled enough to handle, rub off the charred skin, remove the seedpod and rinse briefly under cool water. Allow the other vegetables to cool. Slip the skins off the garlic and pull the stem off the serrano (no need to remove the seeds). Scoop them into a blender along with the tomatillos (and any juice on the baking sheet), onion and a scant teaspoon salt. Process to a coarse puree. In a microwavable bowl, sprinkle the potatoes with a tablespoon of water, cover with plastic, poke a few holes in the top and microwave at 100% for 4 minutes. Heat the oven to 325 degrees. In a medium (4-quart) heavy pot (preferably a Dutch oven) set over medium-high, heat enough oil (or one of its stand-ins) to coat the bottom. When the oil is hot, dry off the meat with paper towels, sprinkle it generously with salt and lay it in the pan (lay the cubed shoulder in an uncrowded layer). Brown on all sides (this takes 5 to 10 minutes) then remove the meat to a plate and add the tomatillo mixture to the pan. Let it reduce and concentrate, stirring frequently, for about 4 minutes. Then roughly chop the poblano and add it to the pot along with the potatoes. Finally, stir in the broth (or water) and epazote. Return the meat to the pot, cover and slide it into the oven. When the pork loin reaches 145 degrees on an instant-read thermometer (about 30 minutes), remove the meat to a plate, loosely cover with foil and let it rest for 10 minutes to reabsorb the juices. When ready to serve, reheat the sauce over medium, taste and season it with salt (usually about 1 teaspoon). Slice the meat, lay the slices overlapping on 4 warm deep dinner plates, then spoon the sauce and potatoes over and around it. If using cubed pork shoulder, braise until tender (that takes about 1 hour), season the sauce with salt, then spoon the delicious mixture into deep plates. Either one benefits from a fresh garnish of cilantro leaves. Tried this tonight and it was superb! Took longer than 30 minutes in the oven, but it was a larger pork loin. Will definitely be making this again. 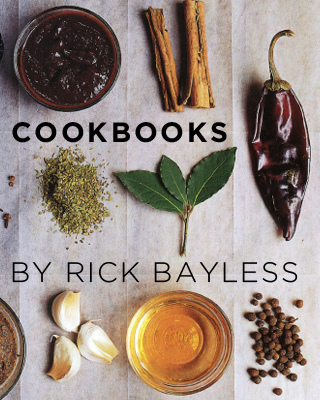 Rick Bayless I love your shows “One Plate AT A Time” so grateful to get your recipes, I have several and your books. I love fixing such beautiful dishes that are not what everyone thinks a traditional Mexican dish would be. (my non Hispanic friends). Wonderful dish. My family was so impressed. Daughter now makes tomatillo sauce to put on EVERYTHING! Thanks, Rick. Hope your show will return to PBS. Miss you! 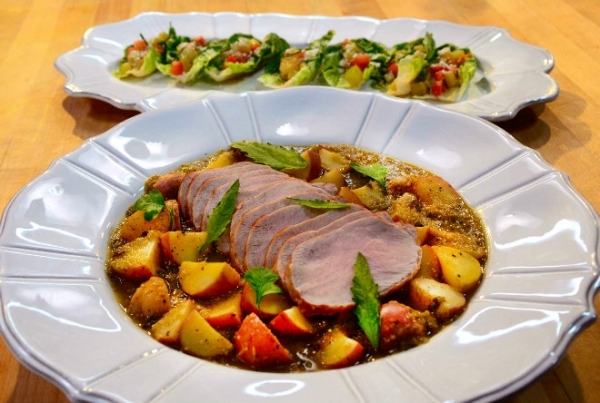 This recipe is just so good! I tried this for dinner last night and it was a hit with the entire family. Thank you so much Rick! You are right, this is THE sauce I should know by heart! I just saw this on the PBS station in Tucson. If you are just making the sauce do you saute the sauce and add the chicken broth or is that for the pork and potato dIsh? Yes, cook the sauce. It helps to bring intensity to the flavor of the sauce.